What's the year started like? So far, 2013 has been a mixed bag and very interesting. Incredible sales results are mixed with some dead open inspections. How can that be? Quality motivated buyers are taking the initiative and seizing the day. It appears current buyers believe that we are in a period where opportunities are as good as they are likely to be for this current "down cycle". Personally, I believe we are bouncing along the bottom, and this could be the norm for the foreseeable future. I see nothing on the horizon to trigger the market to suddenly take off. Transacting in this market is better than in a boom; costs are lower and selection is better. This is an awesome time for entering the market or accumulating property; it is the absolute best time. On the world’s rich list, there is a common theme… the majority of sustained wealth appears to still be associated with people who are in property. Large property players are always either buying or selling. When the market is slow they begin to buy up and accumulate property. This equips them to transact in the boom where they will then actively sell their stock. My understanding is that many of the people on this rich list are long-term players because they act counter cyclical – buying at the bottom and selling at the top. I don't pretend to have all the answers, but I do like bricks and mortar. I like to be able to touch and see my investments and I really like to have full control of what I do with my money and investments. Property is simple, not reliant on third parties and is easily understood. On Friday 18 January at 5.30pm down at Victor Harbor, we are having a get together of people who want to know more about property investment in 2013. 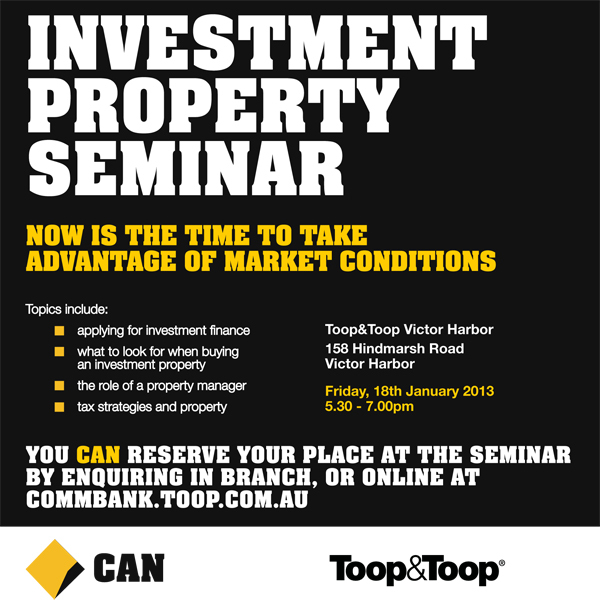 This is a joint seminar with Commonwealth Bank and we will have the experts there to answer all your questions. If you are on holidays in the Fleurieu, a local or just want to take a drive down, be sure to come along. It's free, no hard sell at all, but we will run you through how easy property is to invest in. You’ll also be able to wander through our brand new Fleurieu Real Estate Gallery and see what property in the region is all about, and what opportunities are around. See visually what we are talking about. The smart money always acts counter cyclical. When it is not trendy to be buying, smart investors buy. As we covered last week, I genuinely believe we are witnessing generational BEST BUYING down on the Fleurieu, and there is such an enormous upside for long-term investors. I've heard it too often: "if only I had bought a few years ago." Well, that time is now… "A few years ago" is actually right now. The same is true across the entire real estate market. Numbers may be down at some inspections but the quality is up. Buyers are becoming more decisive and confident, there seems to be a sense that the time to act is now. See you all down the Fleurieu on the 18th!